In 1987, the Grim Reaper sexual health campaign was launched Australia wide. The adverts featured the image of a grim reaper “bowling over innocent victims” in a bowling alley and spread images of fear and shame around sexual health and specifically HIV/AIDS. Whilst this campaign was very effective at spreading fear of HIV, it did nothing to empower people to make their own sexual health decisions, and take control of their own sexual health. The effect of the campaign was an acknowledgement that HIV was in the community, and it was something to be feared if people did not use condoms. In response to these adverts, Aunty Gracelyn Smallwood – an Aboriginal Sexual Health Worker in Townsville, recognised that the Grim Reaper adverts did nothing to promote sexual health within Aboriginal and Torres Strait Islander communities. Her fear was that the current sexual health education did not reach Aboriginal and Torres Strait people at a cultural level, and therefore was not appropriate for her community. In 1987, Aunty Gracelyn Smallwood, with a number of other Aboriginal Sexual Health Workers in Townsville, worked on developing a sexual health resource which was culturally-based. Through their hard work, foresight and imagination – Condoman was created, by Aboriginal and Torres Strait Islander people, and for Aboriginal and Torres Strait Islander people. 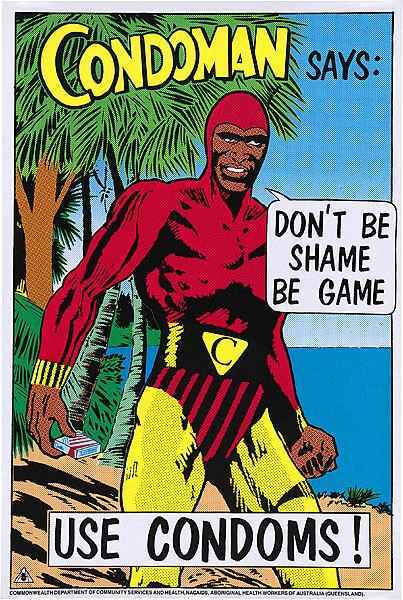 Condoman very quickly became an iconic figure for sexual health and the prevention of HIV/AIDS within Aboriginal and Torres Strait Islander communities. The message “Don’t Be Shame Be Game” has reached generations of Aboriginal and Torres Strait Islander people because it was culturally-based. In 2009, Condoman was relaunched by Brendan Leishman (Health Promotion Officer – 2 Spirits Project), with the support of Queensland Health and the Queensland Aboriginal and Islander Health Council (QAIHC). The image of Condoman was rebranded and updated. A range of resources were launched including key rings, comic books, posters, condom packs and a Facebook page. The Commonwealth Office of Aboriginal and Torres Strait Islander Health (OATSIH) own the trademarked name “Condoman” and the original poster design, whilst the 2009 Condoman image/ design are trademarked to the Queensland Association for Healthy Communities.